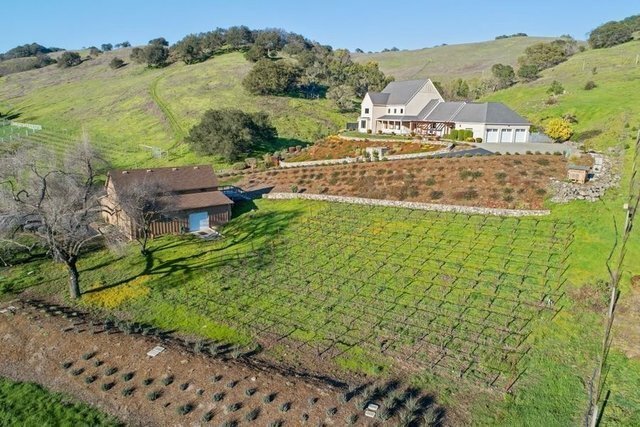 Discover the best of wine country living in this grand scale, view home on 3.1 acres overlooking picturesque vineyards & hills in a highly desirable area of Eastside Sonoma. A gated private drive leads to the custom-built, knoll-top residence w/4 ensuite bedrooms plus 2 half baths, pool, spa, cabana, bocce court & delightful entertaining areas. For the aspiring home winemaker, there is even a small hobby vineyard & a large barn.Upon entering the home, high ceilings, wide hallways & large windows create an extraordinary sense of space. Quality craftsmanship & upgrades are evident throughout. 1st floor public rooms flow easily & include a foyer, formal dining & living rooms, a butlers pantry, office, kitchen, atrium, family room, eating area & large laundry room w/storage. A luxurious first floor master suite wing has his & hers closets, jetted tub, walk-in shower & access to the pool & grounds.A fabulous gourmet kitchen is anchored by a generous center island & dining bar & features extensive custom cabinetry, top-of-the-line appliances, dual ovens, two refrigerators, large capacity wine refrigerator, farm sink, huge pantry & a door that leads to the covered front porch & parking area convenient for catering. Adjoining the kitchen is an open eating area & family room w/open beam ceiling, fireplace & French doors to the grounds.The second floor of the home is comprised of three, generous ensuite bedrooms w/views, storage areas & additional laundry room. House systems are easily accessed from here.The barn has utilities, a slab floor, two rollup doors, a refrigerated walk-in, multiple storage & workshop areas, an office & a half bath w/exterior access. Infrastructure includes an attached 3-car garage, solar heated pool, security system, engineered septic system, private well & filtration system.Casual elegance in a serene country setting, just 10 minutes to the vibrant Sonoma Plaza & downtown amenities & about 1 hour from San Francisco.